The liver is your largest internal organ. This vital organ carries out a myriad of functions, including converting food to energy, producing bile for digestion and removing wastes and poisons from the bloodstream. In order to maintain optimum liver function, consuming healthy food is paramount. One healthy fruit that is good for your liver is the avocado. It contains nutrients that aid in liver functioning and enhance overall liver health. Avocados are high in fat and contain approximately 22.5 grams of fat per medium fruit. However, the majority of this fat is monounsaturated fat, known as "good fat." Consuming monounsaturated fat assists in decreasing low-density lipoproteins or "bad cholesterol" and increasing high-density lipoproteins, known as "good cholesterol." Good cholesterol helps clean the blood and arterial walls by diverting the bad cholesterol to the liver. The liver functions to break down and remove these fats. Fatty liver disease is characterized by a surplus of fat in the cells of the liver, which can lead to liver inflammation and hardening. Replacing saturated fat with monounsaturated fat, and eating low-glycemic foods, such as vegetables and some fruits, instead of high-glycemic foods, such as chips and sugary snacks, can help individuals with fatty liver disease. Avocados not only contain monounsaturated fat, but also function as a low-glycemic food. According to a 2007 animal study published in the "World Journal of Gastroenterology," daily consumption of monounsaturated fat and limited saturated fat may help lower triglyceride levels in the liver, particularly among individuals with non-alcoholic fatty liver disease. The avocado provides over 20 minerals, vitamins and plant nutrients. Some of the most prominent vitamins in an avocado include vitamin B6, folate, vitamin E and vitamin C. B vitamins, like vitamin B6 and folate, support overall liver health and assist in breaking down fats. Additionally, a deficiency in folate is associated with an increased risk of liver cancer. Other vitamins, such as vitamin E, can help reduce liver inflammation and scarring among children with fatty liver disease, according to Columbia University. Similarly, vitamin C aids in flushing fats from your liver, which can assist in preventing cirrhosis. 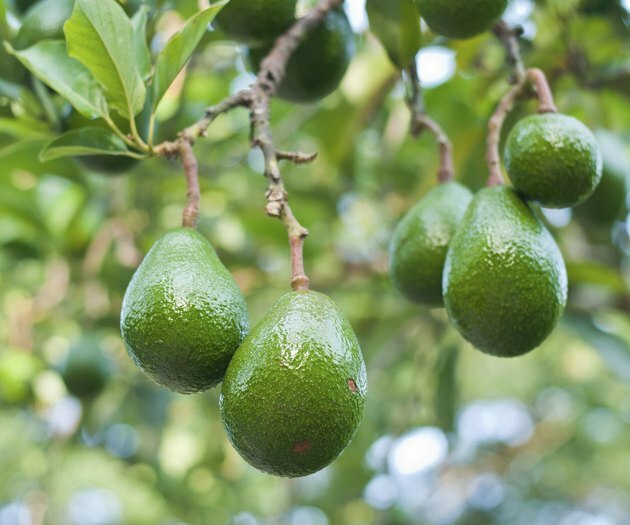 The skin on an avocado and seeds found in the fruit's core are poisonous to animals. Animals, such as cows and horses, consuming these parts of an avocado exhibit decreased appetite and potential lung and liver damage. It is unclear if these symptoms appear among humans digesting the skin or seeds. Health Services at Columbia: Avocados Are Fatty – Are They Healthy?